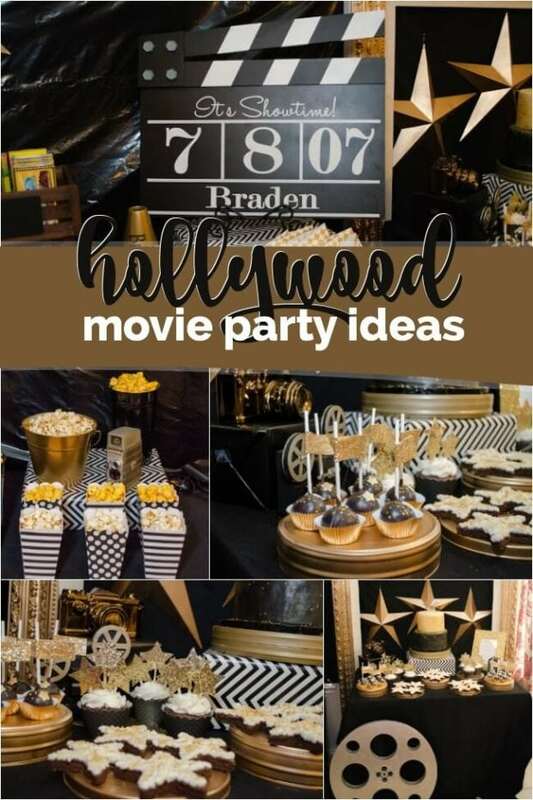 If you’re planning to roll out the red carpet in celebration of a special boy’s birthday, you definitely want to check out this boy’s Hollywood movie themed birthday party! 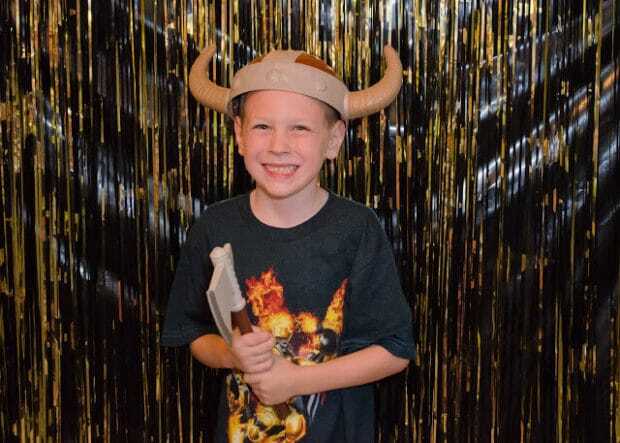 A lover of Hollywood glitz and glamour, Toni of Creative Designs by Toni, planned this star-studded event for her seven-year-old son who also loves movies. 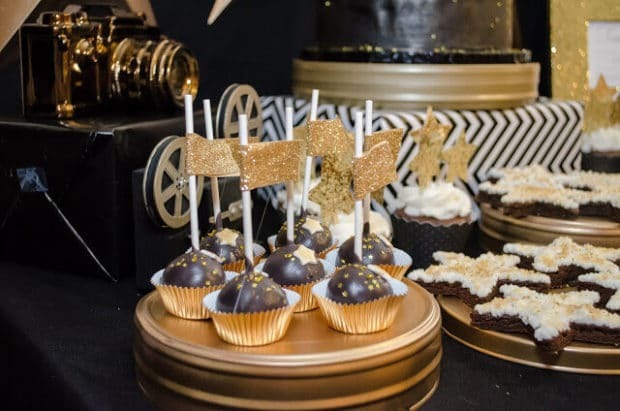 Toni took a creative approach to this theme, incorporating a lot of black and gold into the party decorations, birthday cake and even the party favors. 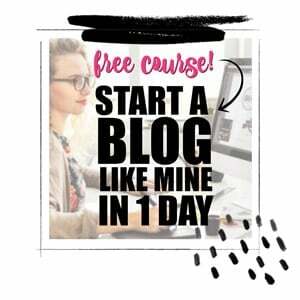 Get ready for a show stopping celebration! Details! Details! Details! Don’t miss the details in this Vintage Horror Movie Dessert Table. Check out the awesome Sci-Fi details in this Tron Birthday Party + Dessert Table. 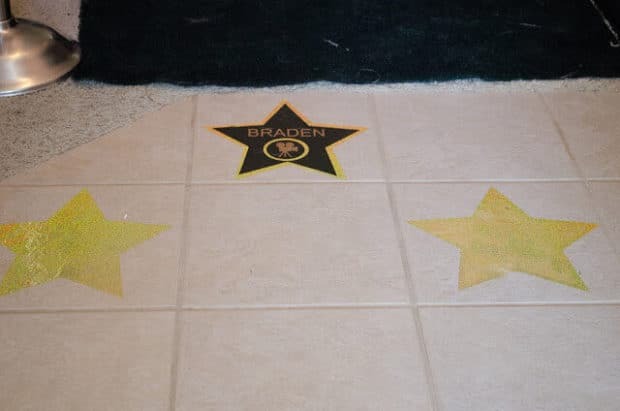 Guests at this amazing party were greeted with a mini Hollywood “Walk of Fame”, complete with a personalized star Toni created out of vinyl to celebrate the guest of honor. Gold glitter stars paved the way for guests to walk the black carpet where the prepped paparazzi was ready for some awesome photo ops. Velvet roping sectioned off the VIP area. 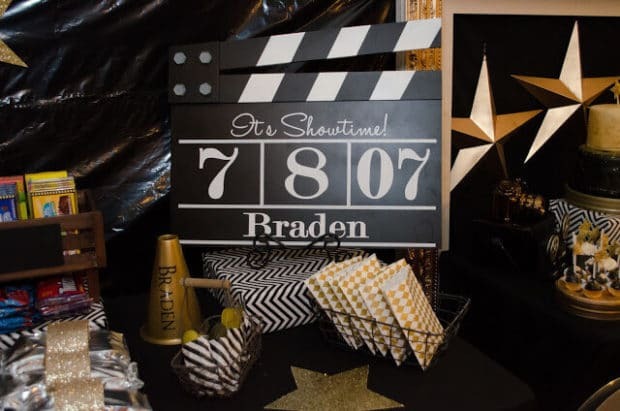 An oversized clapboard provided a perfect theme coordinating backdrop for guests to pose in front of. I love the social media hashtags that were included on the display so friends and family unable to attend could follow the awesome party details. Toni styled an amazing event with three party tables. The first was the fabulous dessert table. The impressive backdrop was made from a large gold frame and 3 giant gold stars. It was overflowing with scrumptious looking treats from Sweet and Sassy Cakes of Forney. 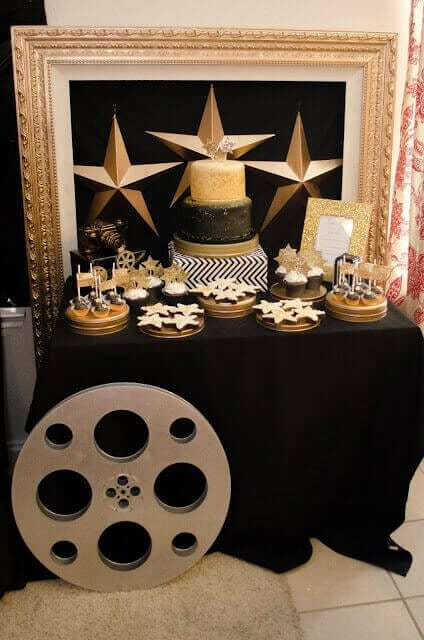 Toni brought in that old Hollywood feel by using vintage movie reels and old film tins as trays and plates for serving up goodies. She painted them gold to match the decorations. Wrapped boxes provided height for the two tiered cake, which was full of glitter and topped with stars—a perfect tribute to the birthday superstar! I also love Toni’s use of old vintage movie cameras as props. Desserts were a plenty and coordinated perfectly with the theme. Cake balls were accented with glitter flags while cupcakes were topped with gold stars. 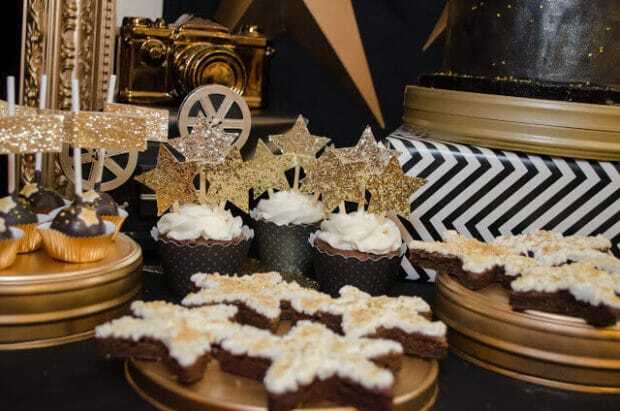 Star-shaped brownies were served up on the movie reel canisters. 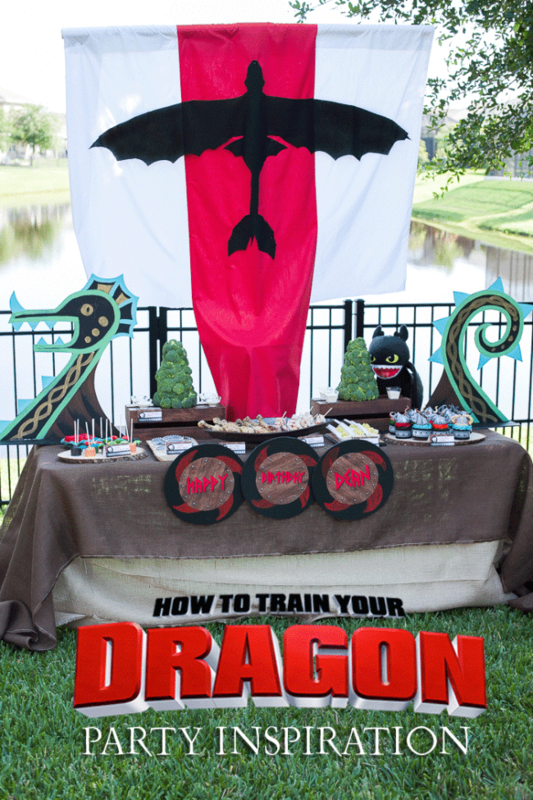 A movie themed birthday party definitely needs a concession stand. Toni also served up some of her son’s favorite movie theater offerings: hot dogs, pickles, pretzels and a variety of boxes of movie theater candy. To bring in that Hollywood flair, she wrapped the hot dogs in gold glitter ribbon and served the pretzels and pickles in black and gold bags. 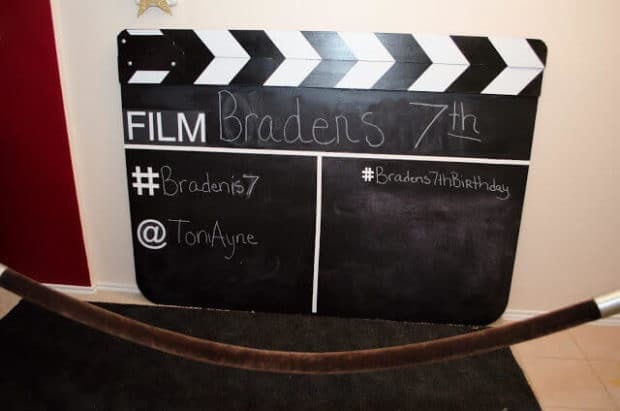 A clapboard and director’s megaphone made perfect party props to finish off the table. Can you imagine a movie birthday party without popcorn, and lots of it? Toni couldn’t either! She served four different kinds of popcorn in adorable striped and polka-dotted popcorn boxes, with refills in metal tins: kettle corn, butter flavored, caramel and regular popcorn. Guests had the option of mixing in flavored salt toppings or chocolate candies for added flavor. I love Toni’s handmade black and gold banner over the popcorn table. It provided the perfect touch of glitz to punctuate the dramatic black backdrop. 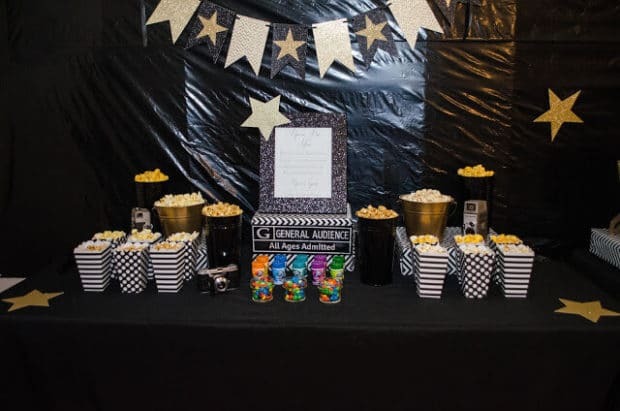 After the VIP treatment and a decadent lineup of sweets and snacks, attendees had fun at the “main attraction” — watching the guest of honor’s favorite movie! Between the show and the cool photo booth, complete with props, guests at this party had plenty of in-home entertainment to choose from. I’m in love with the favor area! 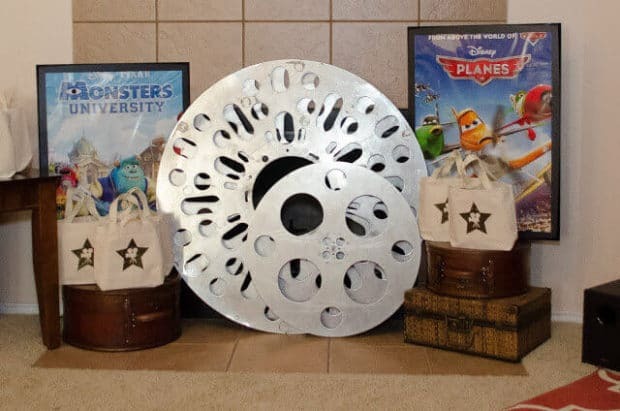 Decked out in movie posters and old fashioned movie reels, it was the perfect spot for setting up favors. To show appreciation for guests who attended this birthday premiere, each child was given a custom glittered movie tote. 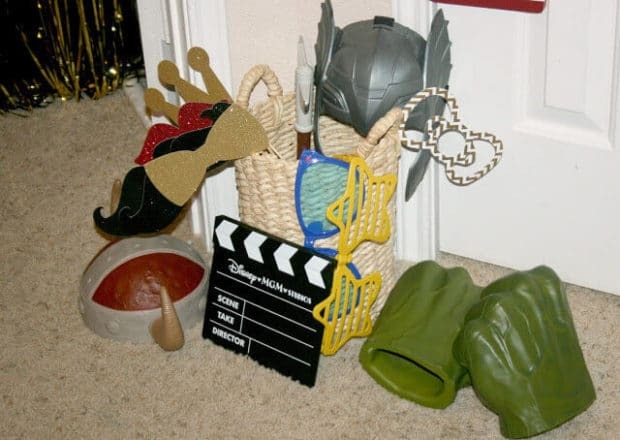 Inside, there were matching tumblers, created by Toni, to coordinate with the Hollywood movie party theme. Lights, camera, birthday! What an amazing celebration!